Key West is known for it’s exciting nightlife. Whether you are joining in the fun on world famous Duval Street or seeking a cooler more intimate watering hole, Key West is sure to please with a large selection of Famous Bars & Taverns. 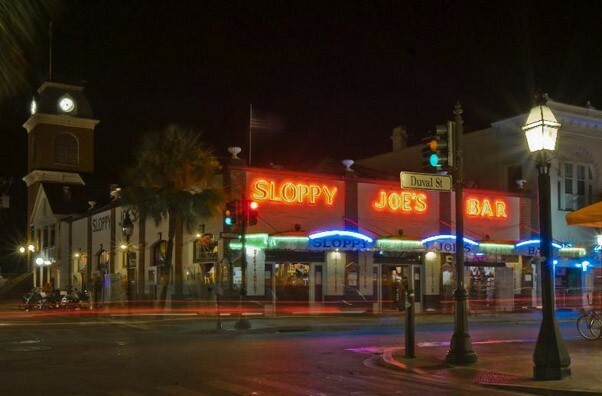 On Duval Street you can dance till dawn to the live music from Sloppy Joe’s Bar, The Hog’s Breath Saloon or Margaritaville just to name a few. Just off of Duval you will find Capt. Tony’s Saloon with it’s kooky Key West charm, The Green Parrot with plenty of live entertainment or The Rum Barrel, owned and operated by Pat Croce, former owner of the 76’ers. On the water, you can’t beat happy hour at Alonzo’s or Conch Republic Seafood Company (known as The Conch Farm to the locals) followed by the coolest musical sounds from the Schooner Warf Bar. Whether you choose to dine, drink or dance, Key West has something for everyone.